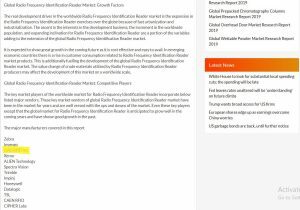 Global Radio Frequency Identification Reader Market Research Report 2018 - GAO RFID Inc. 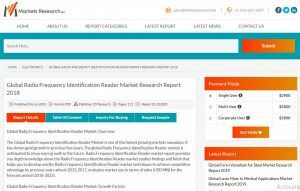 Global Radio frequency identification (RFID) reader market report analyzes RFID reader market status from 2013 to 2017 and forecasts the market growth to 2025. RFID Reader is currently one of the fastest growing markets and is expected to show more growth in the future. Fast urbanization and industrialization are few of the major reasons for the fast growth of the RFID market. Most of the development is from emerging countries due to the advancement of the development business in the district, fast urbanization, and strong government arrangements. GAO RFID is considered as one of the major manufacturers in Radio frequency identification reader market. GAO RFID offers a wide range of RFID readers to meet the demands every business environment. GAO RFID readers are designed to comply with global frequency standards thus making them compatible with most RFID Tags. GAO RFID offers a wide range of readers that operate at low frequencies (LF), Medium Frequencies (MF), High Frequencies (HF) and Ultra High Frequencies (UHF).